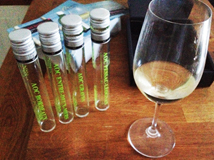 The road to White Bordeaux is paved with good ideas. 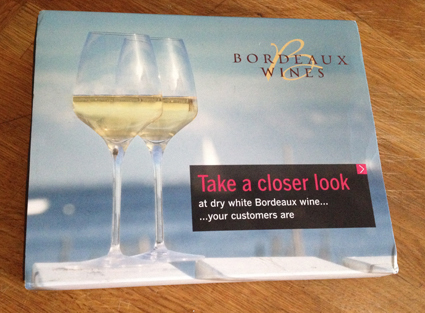 Firstly I should make it clear that I really like white wines from Bordeaux. Apart from the sublime sweet wines of Sauternes, Barsac and the often better value satellite appellations of Cadillac, Loupiac, and Premières Côtes de Bordeaux, the dry whites of Bordeaux are frequently among France’s most interesting. Dry whites from Bordeaux are made from a blend of Sémillon (a distinguished and not-popular-enough white variety with waxed lemon flavours and a wonderful almost oily texture), and the eternally popular Sauvignon Blanc (with its gooseberry, lime, elderflower and grassy fresh flavours). Although they can in the main be made from 100% of either variety, they are usually blends of the two, and are often more than the sum of their parts. (There are several other varieties permitted, but as a generalisation these are used for the sweet wines and do not represent a high percentage of the plantings). There is dry white Bordeaux at all price levels, from a simple Bordeaux AC or Entre-Deux-Mers, all the way to the rarefied dry whites of the very top Châteaux, which can often rival the reds in price. Problem is, and seemingly always has been, selling them. With dry whites only around 18% of the production, most people consider Bordeaux to be a red wine region first and foremost, and possibly only that. 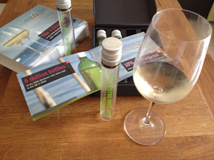 So, any new initiative is to be welcomed, and it was with some pleasure that I was given a tasting pack of four phials of White Bordeaux wines, along with a well presented booklet full of information. It is difficult to know whether the pack is aimed at general consumers (in which case there is too much information) or retailers and professionals (in which case there might not be enough), but it is a valiant attempt. The problem is with the wines themselves. As a tasting exercise, the samples should shine, but unfortunately three of the four in this pack did nothing whatsoever to promote the region, in fact, despite being sealed with screw caps, they were tainted. First the generic Bordeaux AC 2013, as likely as not 100% Sauvignon Blanc, or at least in the majority. The aroma was muted and musty. This is very unlikely (although not impossible) to be the taint of 2 4 6-trichloroanisole (TCA) which is the classic compound that causes the so-called ‘corked’ taint, but it could have been another of the anisole family, or plenty of other things. Whatever it was, it killed the wine. Then, onto the Entre-Deux-Mers AC 2013 . Apart from the sweet wines, this is the only appellation in Bordeaux to be reserved exclusively for white wines, such is the prevalence of white varieties within the area bordered by the Rivers Dordogne and Garonne (the two ‘mers’ of the name). It is usually good value, and often a very high percentage of Sauvignon Blanc. This one, however, had the same taint as the first wine, albeit a little less overpoweringly (there was more to the wine though). Third I tried the Graves AC 2013. This wine was not tainted, or at least if it was it was to a degree less noticeable than the first two. There was oak to the wine and it was palatable with some honeysuckle, green apple and spice. It wasn’t the best white Graves I’ve had though, and with no reference to prices, would not really have converted a sceptic I fear. Finally, the Pessac-Léognan AC 2012. This is the top dry white appellation of Bordeaux, and is a small, superior part of the north of the Graves region. Within its boundaries lie the famous estates of Haut-Brion, Smith Haut Lafitte and Malartic-Lagraviere. I had high hopes for this wine, as it almost certainly came from a top property. Sadly, however, the wine had the same taint as the first two, and if anything it was worse. It was from a different property and vintage, so I can only assume that it was the repackaging process that caused the problem, and somehow I was just lucky with the third wine. What fruit and oak there was in this wine was dominated by the unpleasant musty cardboard flavour. So, the lesson is that if you are going to try to sell your wares by sampling them, it is paramount to ensure that the samples are in perfect condition. I will certainly not let this disappointing experience put me off a wine style that I love, and I recommend that neither do you. But - hopefully without coming across as snooty - many people given this pack might simply think the wines are not very nice (and consistently not very nice at that). It’s not the marketing disaster of ‘new Coke’, but it’s not what it could so easily have been. Shame.